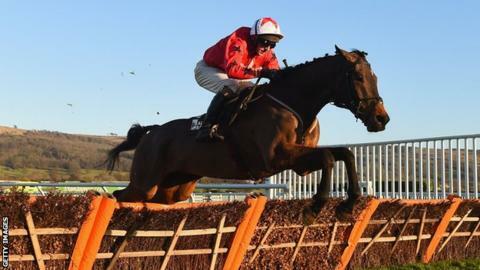 Blaklion delivered a statement of intent for next year's Grand National with an impressive nine-length victory in the Becher Chase at Aintree. Gavin Sheehan rode the 7-4 favourite, trained by Nigel Twiston-Davies, to a record sixth victory in the race. Last Samurai (7-1) was second and Highland Lodge (12-1) third in a race run over the Grand National course. Elsewhere, Politologue held off Fox Norton to give trainer Paul Nicholls a 10th win in the Tingle Creek Chase. The Colin Tizzard-trained Fox Norton went off the 8-13 favourite but was beaten by half a length by 7-2 chance Politologue, ridden by Harry Cobden, with Ar Mad third. Blaklion is a short-odds favourite for the Grand National after the slickest of performances to comfortably dispose of some Aintree regulars. The race isn't until April, and much water must still flow under many bridges, but there will be few more convincing candidates on this evidence. The horse didn't quite 'get home' over the four and a quarter miles last time when fourth, and that will be the concern when we get to the big race. At Sandown, Politologue jumped absolutely beautifully to give Harry Cobden his biggest win to date.